When properly applied, technology solves many problems. Web designers are usually quick to take advantage of technological advances. On the other side of the coin, changing technologies often brings new problems. Those same designers must deal with these problems. Other designers might find the answers to these new problems. Usually, this happens with the help of new tools and resources. When this is the case, clients are quick to jump on board to your competitors. A client might need an easily editable and responsive chart or table. Here, it can be hard to achieve this through brute force methods alone. It’s the same when poor collaboration practices make it difficult to meet a deadline. Sometimes it also happens that tools aren’t available to create a portfolio that stands out. Fortunately, there are tools and resources to help designers cope with changing practices. They can also help with coping with increasingly inflexible client demands. Here are 15, some of which you won’t want to be without. Mason enables you to manage your frontend building and editing activities without code and from a central location. More than merely acting as a useful design aide however, Mason makes it far easier for you to collaborate on building and maintaining real products. Whether your products are in work or deployed, you don’t have to go through an additional design/development cycle every time a change is called for. You simply apply Mason’s login and registration features to authorize and allow individuals to make changes before or after product deployment. You therefore have complete strategic control over both the development and maintenance of your products. Anything you build with a Mason feature will fit in perfectly with the look or feel of an existing website or app. These features consist of pre-coded blocks of content that provide solutions to common requirements. They are created with a focus on building an ideal UI and creating a straightforward path for team members to collaborate on and build your product. With Mason, you can expect to get your deliverables in front of your clients faster and be able to adapt more quickly in response to any changes in requirements. Since Mobirise is an offline builder, it gives you the advantage of having total control over your site-building activities, including deciding where and how your product is to be hosted. Mobirise is strictly drag and drop, so there’s no need for coding. Best of all, this top-rated website builder is free to use for both personal and commercial purposes. Features include 300 free beautiful and trendy website templates and blocks along with 900 premium ones. The package also includes a huge library if 300,000 free images, 850 Google fonts, and 7,000 icons. Mobirise is built around Bootstrap 4 or Google AMP, so your sites will be lightning fast and totally mobile friendly. It’s ideal for building small to medium websites, promo sites, and portfolios. Over 1.5 million sites have been created using Mobirise. Elementor is a free, open source WordPress website and page builder that’s noted for its speed of operation, its ability to work with any template or WP theme, its library of advanced, reusable templates, and it’s free and easy way to build a website without writing a line of code. Developers love to work with Elementor as well. As your design work is done on the front end, you can expect instant results along with complete freedom and creativity to customize layouts and select the design features you need. You can anticipate smoother and faster design workflows when working with Elementor. Its most popular features include the Menu Builder, a Visual Form Builder, Form Integrations, and Custom CSS. Even more useful and exciting features have been included in Elementor 2.0. The new version 2.0 features, which include Blocks, Header and Footer, and powerful WooCommerce shops design controls are being introduced incrementally throughout 2018.
monday.com excels as a team management tool, whether the size of the team is 2 or 2,000 (or more) and widely distributed. Because of its ease of use and the way in which it can boost productivity and promote transparency, monday.com is extremely popular among non-technical teams and users. At present, this team management tool is used by more than 20,000 teams and by companies ranging from startups to Fortune 500 enterprises. It can take time and effort to find the exact hosting service you need. A2 Hosting offers fast, secure, scalable, optimized and fully managed services. Site staging is easy, hosting is extremely fast (20X over most competing services) and complete with automated backups, automated WordPress updates so you are always in sync, and free CDN. You can expect 24/7 support, and in the unlikely event you’re dissatisfied, A2 offers a money back guarantee. 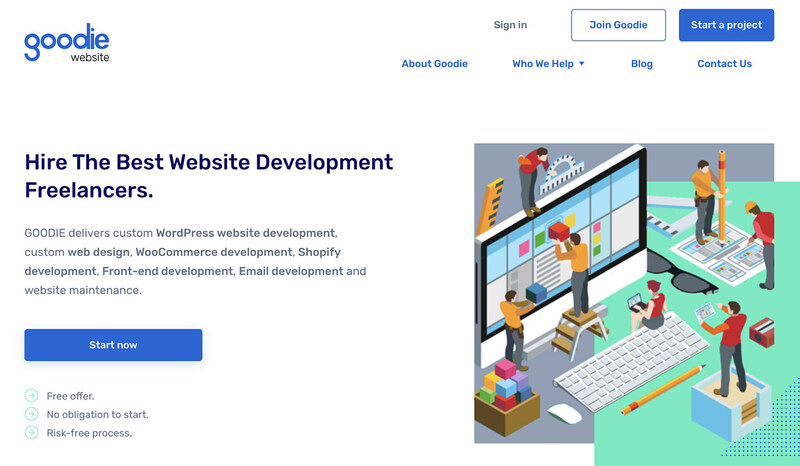 Goodiewebsite connects web designers and business owners with a development team that offers a cost-effective coding service at a competitive price. Goodiewebsite’s services are especially well suited for small and mid-size WordPress sites or design to code conversions. Prices start at $999 and the quality of the finished product is guaranteed. A Houzez-created website provides all key features a realtor will normally expect; features like radius and advanced property search, search composer, geolocation, payment and membership systems, and more. Its property management system allows you to administrate a real estate marketplace, coordinate your agents and accept submissions. Houzez’s custom fields builder enables you to add custom fields to show any information your business model calls for. In addition, its customer support is very caring and efficient. Aptly named, The Hanger provides the ideal solution for anyone in need of a modern-classic WooCommerce theme to build a modern-classic online store. With The Hanger, it’s easy to build a custom website that aligns its look with the retailer’s brand and that of the merchandise. The Hanger is a cinch to set up, and you can always expect friendly and reliable support. This premium multipurpose platform not only enables you to excel at building unique and attention-getting sliders, but you can create awesome slideshows or image galleries, animated page blocks, landing pages, and even complete websites. LayerSlider offers a variety of versatile layout options, it’s responsive, SEO friendly, and its features include hand-crafted templates, a visual drag and drop editor, lifetime updates, and excellent support. Uncode is a powerful, user-friendly theme that allows you to build an awe-inspiring portfolio to showcase your work in just a few hours. Browse Uncode’s library of user models for ideas, inspiration, and to see what Uncode can do for you. New features like Slides scroll, Shape Dividers, and the powerful Gallery Manager ensure that if you can think of it, you can build it. 24,000+ other creatives will vouch that this is true. FFonts.net’s library of more than 75,000 fonts should give you all the design options you need. Since the fonts are free, all you have to do is find ones you want, preview them, and download them. A helpful feature is the ability to write out a string of fonts to see how they will appear in actual use. The fonts are smartly categorized to vastly simplify your search. Fluid UI is a combination mockup, wireframing, prototyping, and collaborating tool that enables teams to share and comment on design information via chat, annotated and video presentations, while speeding up and smoothing out design workflows. With its build-in component libraries, Fluid UI is an excellent design aid for local and distributed teams, product managers, and designers. Creative professionals want more than a portfolio website to showcase their work. They want a professional-looking portfolio website, and better yet, one that features an integrated e-commerce store, blog, and even client proofing. That’s precisely what the Pixpa all-in-one platform provides. With Pixpa, creatives can pull all their tasks together in one place instead of having to rely on several different services. Pixpa is mobile friendly, and it will give you high quality, save you time, and save you money. Get started for free with the 15-day trial. wpDataTables is far and away the best WP table and chart builder on the market today. It is so powerful, and the results are so amazing to see, that web designers have switched over WordPress just for the opportunity to use it. This WordPress plugin accepts multiple data formats from multiple sources and can convert huge volumes of complex data to colorful, responsive, and editable tables or charts in seconds. WhatFontis.com solves an annoying problem that most designers encounter occasionally: coming across a “must have” font, but not knowing its name or where to find it. Given an image to work with and using its 450,000 font database and automated artificial intelligence search capability, WhatFOntis.com can usually identify and produce the desired font in seconds – saving you a ton of time and avoiding lots of frustration. Looking to speed up your workflow or boost your productivity? Maybe, to locate an elusive yet “must have” font? How about finding a suitable host, streamline team collaboration tool? All the above can be easily accomplished with one or more of these top tools and resources for 2018. With one or more of these in your toolkit, you can meet the challenges of ever-changing technologies. We hope you find at least one to brighten your day. The post 10+ Cool Tools Expert Designers Are Using appeared first on Hongkiat.